Have you been on the search of a gorgeous Sienna ostrich bag that will display your elegance and taste in front of anyone who sees you? Now you have your best answer with Gucci Soho Ostrich Shoulder bag – a priceless accessory that will accompany your everyday outfits as well as your most elegant ones and make you feel like a model on the runway all the time, no matter the time of the day or night. Wear it on your shoulder, hold it in your handâ€¦ these details are up to you, but Gucci took care of all the rest. Elegant and comfortable at the same time, Â Gucci Soho Ostrich Shoulder bag brings along all the attributes the Italian fashion house has accustomed us with: style, reliability and durability. Equipped with double chain straps covered by a leather shoulder band, this bag model does not make any compromise, neither on comfort, not on elegance. Â Adorned with leather tassels and yellow gold elements on the outside, it comes with soft leather lining interior, to ensure the long term use. As any modern woman needs a special smartphone pocket, this is also one of the features you will find inside this high quality bag. 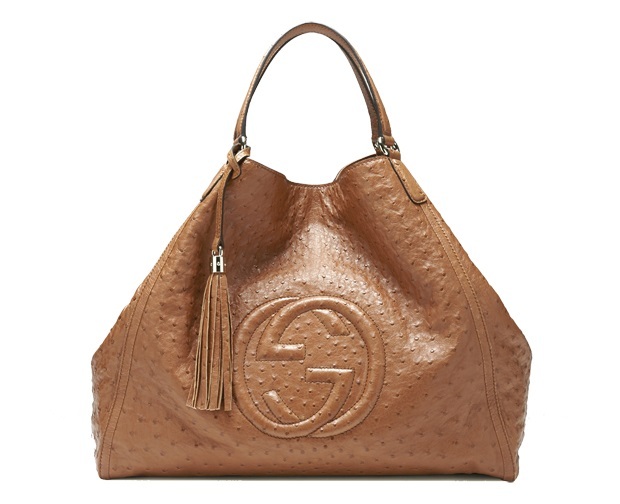 Despite its delicate look, the Gucci Soho Ostrich Shoulder bag is an accessory you can rely on. The appearance needs no introduction as the Gucci signature is certainly visible beyond the interlocked Gs this bag displays on its front. There is no such thing a almost perfect when talking about a Gucci bag, or other fashion item for that matter. The Italian fashion designers think about every single detail, from look to comfort, from elegance to reliability, in order to bring to provide modern women with the products they have always dreamt of.